Scrubs is probably one of the funniest and most clever sitcoms on TV that revolve around the staff of Sacred Heart Hospital. Cleverly narrated by the show's characters, the series involves Dr. John Dorian or J.D. 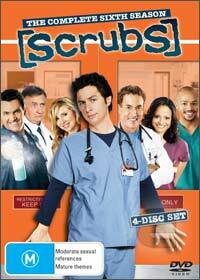 for short (Zach Braff), his best friend Turk and his wife Carla, J.D. 's ex-girlfriend Elliot and my personal favorite, Dr. Perry Cox who is played by the talented John C. McGinley. Each episode is through the eyes of each character and their own perception of how they fit into their surroundings. Add in a variety of other strange hospital characters such as the Janitor who has it in for J.D., the quirky yet straight to the point Dr. Kelso and you have a show made in sitcom heaven. Ironically, the series has a "cartoon" feel to it with the humor and bizarre quirks of the characters with laughs from start to finish. Series 6 is a little more serious than previous seasons that focuses on fatherhood and relationships. The creators also try a "Buffy" style musical episode which actually works quite well as a patient can only hear others singing to them when in actual fact they are only talking. The series also dictates that not everything is what it seems which is carefully layered with humour that comes highly recommend from impulsegamer. The video quality of Scrubs Season 6 is presented in 1:33:1 full screen with Dolby Digital 2.0 Stereo for that almost "movie-like" presentation. Where the set really shines is in the plethora of extras that feature some great deleted scenes and best of all, audio commentary on all the episodes. Definitely a great buy to compliment your Scrub collection or a great Christmas gift. Check it out! My Making Of: "My Musical"